Join us for a great night of food and wine presented by the Great Lakes Culinary Institute. The evening begins with sparkling wine and a raw bar on the Great Lakes Campus catwalk, then moves to Lobdell's: A Teaching Restaurant for five amazing courses and a spectacular view. Guest chefs working in collaboration with GLCI students include GLCI alumna Brooke Mallory (3030 Ocean), Adam McMarlin (Nine Bean Rows), and Jeff Brandon (Superior Foods). Proceeds from this event will be used to bring talented chefs and others from the culinary world to the Great Lakes Culinary Institute to teach and work side by side with students. Thank you sponsors! Great Lakes Great Chefs is sponsored by Superior Foods. Wine is presented by Imperial Beverage. Seating is limited. Please call (231) 995-1021 for more information. Time: Reception 6 p.m.; Dinner 7 p.m. 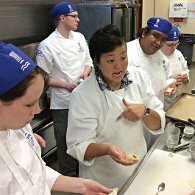 The 2014 version of this special annual event was a unique opportunity to observe Great Lakes Culinary Institute students and instructors learning authentic Chinese cooking techniques from Chef Candice Lee. Lee and the students were joined by Chef Harlan “Pete” Peterson, former owner and chef of the legendary Tapawingo restaurant in Ellsworth.